For companies that depend on quality plastic mailers, Showcase™ PolyMail envelopes are resilient, affordably priced, strong, and extremely innovative. In today’s highly competitive e-commerce and online retailer market, companies have to be careful with the products they use. Specific to mailers, if customers do not receive information or merchandise in a timely and safe manner, they will move on to a competitor. For companies that depend on quality plastic mailers, Showcase™ PolyMail envelopes are resilient, affordably priced, strong, and extremely innovative. Although Polypak Packaging offers a full line of products, such as plastic bags for mulch, security bags, plastic deposit bags, salt bags, custom printed bags, and more, the Showcase™ PolyMail product is truly in a league of its own. These poly envelopes feature a full-sized window on one side that makes it easier to read the destination address while promoting the company brand. The other side of these poly mailers is constructed from the paper-like Rigur material that is bright white. In addition to the ability to write on this material with a ballpoint pen, it is ideal for both pressure-sensitive and water-based address labels. Approved by the United States Postal Service, Showcase™PolyMail envelopes accept both meter tape and standard mailing stamps. These poly mailers from PolyPak also boast a durable “Sure-Seal” closure, and they are water and tear resistant. Overall, the mailers are functional while making a positive and long-lasting impression on the recipient. Simply put, this Polypak Packaging solution is beneficial for business operations and as a key marketing strategy. 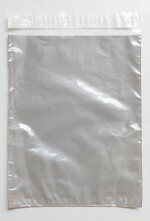 There are four sizes of poly envelopes from which to choose, including 9×12 inches, 10×13 inches, 12×15½ inches, and 14×17 inches, all with a clear front and sold in a quantity of 500. All of the wholesale plastic bags offered by Polypak Packaging are made in the United States from the highest-quality material possible. To meet or exceed customer requirements, they are also manufactured according to strict company and industry standards. Polypak Packaging has been an industry leader for over 45 years. During that time, the company has created numerous products. The company’s offerings include the new Mighty Lite Mailer product line that launched this past September and the new Showcase™ PolyMail envelopes, which provide an outstanding mailing solution and a great marketing tool.